Well, I am “glassy-eyed”. Awoke at 4am to put 3rd fill coat on hull. The deck took only 2. I guess because it is mostly horizontal. 2″ glass tape was added to the stems for potential wear resistance. 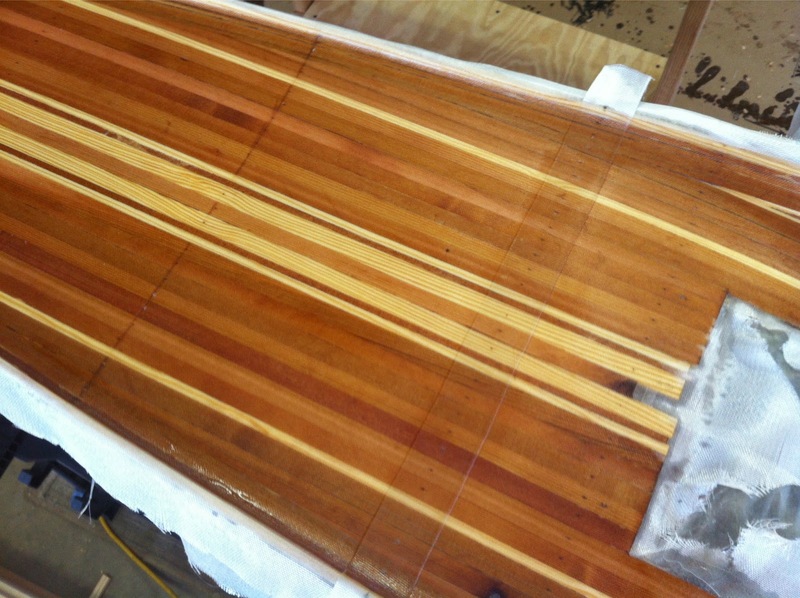 Sacked out until breakfast and then began the scraping, planing, and sanding of the underside of the deck. I wish I had weighed it because quite a bit of wood was removed. I paid a price in labor for using a few less than perfect strips. These were thinner in some portions and while flushed out topside, they left a few foot long depressions down under. At the time, the thought of pulling off the tarps in the snow and ripping a few more strips was not appealing. I also hated to waste those strips. Excluding labor, I will have about $750 invested in this boat when that splash finally happens. This is boat materials only. No tools or strong back which are reusable. Spent maybe 1.5 hrs fairing. Since it is really unseen, I focused in the areas where hatches are going. Otherwise, I let the glass and epoxy do their thing. All in all, results appear good. 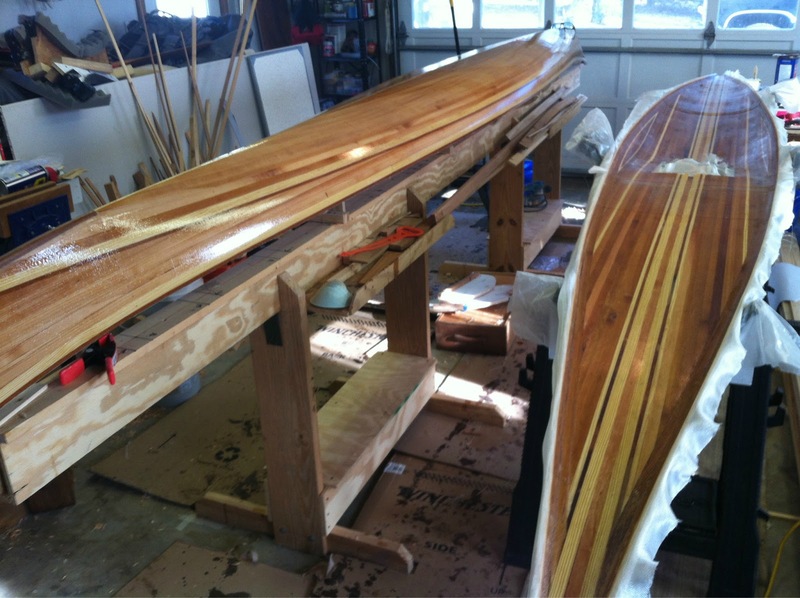 An extra layer was added across the deck for 16-18″ just aft of the cockpit to take stress as paddler (me) slides into the boat. 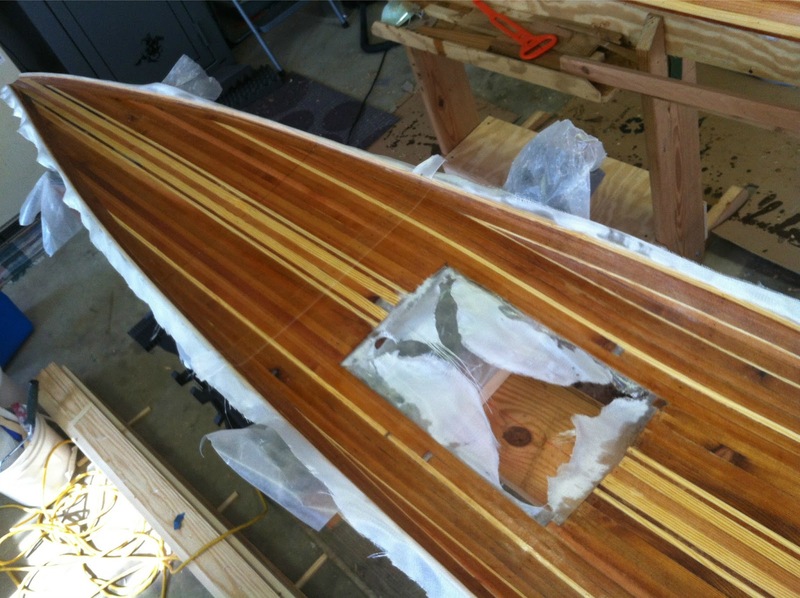 2″ glass tape was also added where the bulkheads will be sealed in. I’m hoping this helps distribute any shock load should the boat land there. At this point I’m tired of fiberglassing. The hull still remains to be done. I may take a detour and work on the cockpit coaming and/or deck hatches and allow the hull to really cure before tackling it. It requires a little more attention than the deck. Good portions of it are exposed. Not that the deck underside is bad at all, I just need to be in the right frame of mind to do it justice. For now, I’m all sanded out. The hull will take some wet sanding. There are stipples here and there. Still, its coming together. I like your philosophy of not counting price of tools as part of the cost of a project! Also know the feeling of getting up in the wee hours to move forward with a project. Your boat is gorgeous! Yes. Adds to the creative book keeping or fuzzy math. Your pick, but we never know how many projects we'll start and hopefully finish. I'm already planning & studying for the next boat. Can you really use a hammer just once (government excepted)? You'll have to give the boat a try when I'm done. We've the 2 other SOF's we built last summer also.